Our silk textile with embroidered silk thread is laminated in a high quality mat finished translucent plastic panels of PVC-based material. 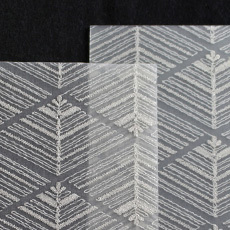 It is named “Silk　Shoji”panel that provides a mat and semi-tranparent misty effect. Its silk eimbroidery patterns are clearly visible especially with back-lighting. 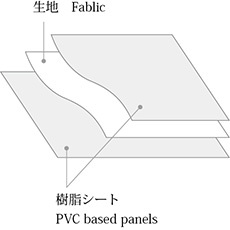 One of the advantages of the Silk-Shoji panels is that it can be made very thin. And it allows light penetration. It can be installed even in the ceilings or over head applications. The installed lighting behind　emphaxizes the beauty of silk embroidery. It delivers improved durability and strength. The heating process of laminating makes natural fabric slightly “twisted” . The delicate silk of natural material may have slight distortion of pattern.